BRUSSELS (AP) — European regulators’ latest swipe at the dominance of U.S. tech giant Google could open new opportunities for rivals in search and web browsers — that is, if cellphone manufacturers decide to make the most of the opening. 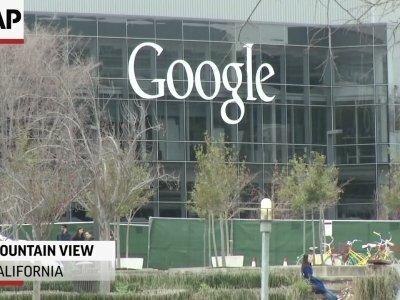 The European Commission on Wednesday fined Google a record $5 billion for forcing cellphone makers that use the company’s Android operating system to install Google’s search and browser apps. It also set a 90-day deadline for Google to rectify the problem or risk further fines. A remedy could involve unbundling its core apps Search, Chrome and Play Store from eight other apps it packages with Android. The company could also decide to reverse its practice of barring Android manufacturers from selling devices using altered versions of Android, such as Amazon’s Fire OS. EU Competition Commissioner Margrethe Vestager said concerns about restricting competition “wasn’t just a remote possibility from theory books.” She said Amazon tried to license its Android-based Fire OS in 2012, but Google’s contracts prevented it. “Manufacturers could not launch Fire OS on even a single device,” she said. It’s also possible not much will change. Google Search, Chrome and the Play Store are popular with consumers and developers. Cellphone manufacturers could still choose to include them despite unbundling. Still, some U.S. politicians welcomed the fine. Democratic Sen. Richard Blumenthal of Connecticut tweeted that the fine should “be a wake-up call” to the Federal Trade Commission and should lead U.S. enforcers to protect consumers. Blumenthal previously called on regulators to investigate how Google tracks users of Android phones. The EU took issue with Google’s payments to wireless carriers and phone makers to exclusively pre-install the Google Search app. Neither fine will cripple the company. Google parent Alphabet, made $9.4 billion in profit in the first three months of the year and has more than $100 billion in cash reserves. “What is important is that Google has to change its abusive behavior,” said Rich Stables, CEO of the rival search engine Kelkoo. Android is technically an open-source operating system that Google lets cellphone makers use for free. As a result, it is the most widely used system, beating Apple’s iOS by a wide margin. Google argues that downloads are easy and while the inclusion of its suite of apps help phones run well out of the box, competitors’ apps are a tap away. They have likewise taken a harder line on data privacy. After the scandal this spring involving the misuse of Facebook users’ personal data during the U.S. presidential election and other campaigns, the EU began enforcing tougher new rules. Nakashima reported from Menlo Park, California. Associated Press writers Matt O’Brien in Providence, Rhode Island; Nick Jesdanun in New York; and Michael Liedtke in San Francisco contributed to this story.